EBay CEO John Donahoe explains why he rejected Carl Icahn’s request to spin off PayPal and his decision to sell Skype. The times they are a changin’ at eBay. Analysts believe growing competition in the online payment sector -- in particular from internet juggernauts Apple (NASDAQ:AAPL), Amazon.com (NASDAQ:AMZN) and Google (NASDAQ:GOOGL) -- prompted Tuesday’s announcement that eBay and PayPal are splitting into two companies. Apple Pay and other companies’ move into payment technologies likely spurred the move, said BGC Partners technology analyst Colin Gillis. Gillis added that PayPal had become a large enough business in its own right to spin off. 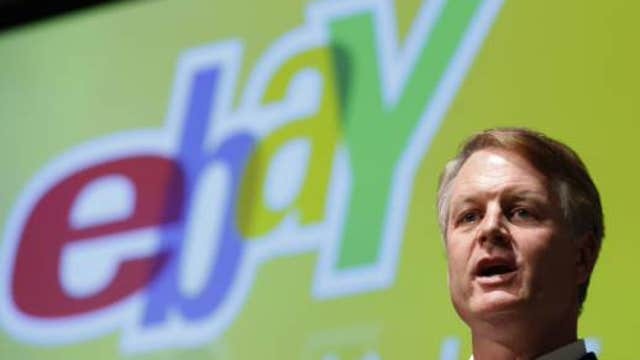 Just six months ago, eBay (NASDAQ:EBAY) CEO John Donahoe said he would not spin off payments company PayPal. But on Tuesday, Donahoe announced a plan that would split the two businesses into standalone publicly traded companies in 2015. In a March interview with FBN’s Maria Bartiromo, Donahoe shrugged off activist investor Carl Icahn’s calls to separate the companies. “[W]e believe that eBay and PayPal together make each more successful and drive greater growth,” said Donahoe at the time, citing synergies between the two businesses in the areas of mobile commerce and risk management. “We see that time and time again where PayPal in key areas gets started on eBay, which then allows it to grow faster off of eBay,” explained Donahoe. However, the company will soon have to stand on its own. In a statement released Tuesday, Donahoe said a strategic review showed that keeping eBay and PayPal together would prove to be less advantageous to each business down the line. “The industry landscape is changing, and each business faces different competitive opportunities and challenges,” said Donahoe. While Gillis couldn’t say what effect Icahn had on the decision, he did say that the timing of the split was sooner than he had anticipated. “I bet if [Donahoe] wasn’t prodded a bit, the split would have been announced mid-2015 or 2016 … This move was widely expected, but the news came a little faster,” he said. Shares of eBay were trading 7% higher mid-morning on Tuesday on the news.